You have a download coupon with an eight-digit code number, which consists only of digits? Bring your voucher or voucher code in the evening of your visit. Please do not forget to make a reservation*! Each 4-course menu costs 35 EUR including an aperitif. The menu can be found here. Please note that you will find us at Saarbrücker Straße 36-38 now! Bring your voucher or voucher code in the evening of your visit. Please do not forget to make a reservation*! The menu can be found here*. * You will leave the Internet presence of unsicht-Bar GmbH via the links marked with an asterix. The individual unsicht-Bars have different, different operators. 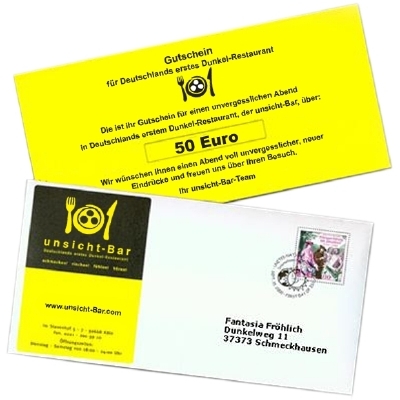 You have a "yellow" voucher from cardboard of the unsicht-Bar Hamburg? Or a brown cardboard voucher with the inscription "Dunkelrestaurant Hamburg"? Bring the vouchers on the evening of your visit and just show them. You have a yellow brown voucher made of cardboard with the inscription "Dunkelrestaurant Berlin" or a yellow voucher made of cardboard with the address "unsicht-Bar Berlin, Gormannstraße 14, 10119 Berlin? These vouchers were issued by the former operator of unsicht-Bar Berlin, Arbeit für Blinde und Sehbehinderte GmbH. You can redeem these vouchers at any time in the unsicht-Bar Hamburg, unfortunately no longer in Berlin. If this is not possible, please contact Arbeit für Blinde und Sehbehinderte GmbH, Gormannstraße 14, 10119 Berlin, info@dunkelrestaurant-berlin.com. You have a voucher issued by the dark restaurant "Nocti Vagus" in Berlin? Bring the vouchers with you on the evening of your visit and redeem them on site.